In May 1939, only months before the outbreak of the Second World War, King George VI presided over the inauguration of Canada’s National War Memorial in Ottawa. Dubbed “The Response,” the memorial presented an idealized view of Canada’s reaction to the First World War, and its inauguration was rich with symbolism evoking triumphant patriotism and devotion to the monarch. 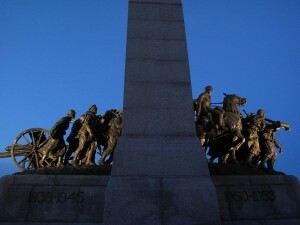 This monumental unveiling represents the culmination of a period of monument building in Canada. Indeed, most monuments still seen on Canada’s streets date from the era between 1890 and 1939. Although monuments continued to be raised after WWII, the monumental landscape was largely established by 1939, reflecting the values of that era. Canada was not alone in these efforts. A similar process began slightly earlier in Europe, Britain, and the United States, as 19th century nations sought ways to honour important people and commemorate events. They began building monuments for reasons associated with what English historian Eric Hobsbawm has called “the mass-production of traditions.” As nations industrialized and grew in size, they began to formalize and ritualize symbols of power and national cohesion. Monuments aided this process in a number of ways. As memorials, they helped perpetuate memories and aid civic education by recognizing great leaders and accomplishments; they helped direct common values, offering examples of civic virtue for mass consumption. Thus, monuments helped shape a sense of national history that was closely linked to national institutions: they presented political, ideological messages. Yet, while official monuments attempted to enshrine an official narrative of Canada’s past, monuments could be hotly contested, since different groups saw history differently. Certainly, there had been monuments raised in Canada prior to the industrial revolution. In the 18th century, American soldiers occupying Montreal during the American Revolution destroyed a bust of George III standing in a city square in Montreal, which demonstrated the deep and contested meanings monuments represented for people. In 1809, following the death of Admiral Horatio Nelson in the Battle of Trafalgar, Montreal raised another and more enduring monument to the hero, an action that was repeated around the British Empire. In the 1820s, Lord Dalhousie tried to pacify local sentiments by placing a monument honouring both Wolfe and Montcalm in Quebec City. In the middle years of the century, other heroes, such as Generals Wolfe and Brock, as well as events such as the Battles of Sainte-Foy and Ridgeway, were also memorialized by monuments. However, it was not until the late 1880s that Canadians begin to raise monuments in significant numbers. Between 1885 and 1922, the lives of eight Canadian statesmen were celebrated with monuments on Parliament Hill in Ottawa, linking central Canadian politics to a particular vision of historical significance. However, away from the capital, monument raising focused on other heroes and events, and reflected other ideas about history. For instance, at Quebec City in 1898, civic leaders argued over the best depiction of Samuel Champlain in the monument they were building. The interpretation that emerged from these disputes purged Champlain’s religious identity to make him simply the governor of New France, a precursor of Canada’s Governor-General. After WWI, the focus in much of the country turned away from great figures towards the common soldiers who had laid down their lives to defend their hometowns. As historian Jonathan Vance documents, Canadian communities from Coast to Coast designed and built monuments to honour the local sons who had fought for king and country in the Great War, which culminated in the unveiling of the National War Memorial. This phenomenon was less pronounced in Quebec where the war had been unpopular and where monument building in the 1920s turned instead to heroes of Quebec’s past. Despite efforts to stamp a singular message on Canada’s monuments, the histories they told could be highly contentious. 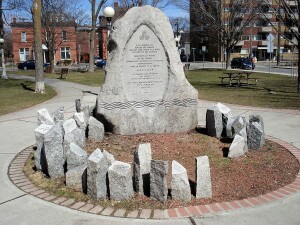 Figure 12.35 Memorials have ceased to be the monopoly of heroic figures and leading politicians as “Enclave” (the 1992 Ottawa Women’s Monument to women murdered as a result of domestic violence) attests. and her colleague Ian Radforth makes his observations here. Monuments and memorials have been used to assert authority, acknowledge the legitimacy of members of a society, and craft the basic outlines of history itself. Outwardly straightforward, monuments and statuary in Canada have often been divisive and interpreted (or reinterpreted) in conflicting ways. National War Memorial in Ottawa (1) by R. Wolsak is used under a CC-BY-NC-SA-2.0 license. MintoParkMemorial by Padraic Ryan is used under a CC-BY-SA-3.0 license. 12.12 Monuments and Memory by Alan Gordon, Department of History, University of Guelph is licensed under a Creative Commons Attribution 4.0 International License, except where otherwise noted.